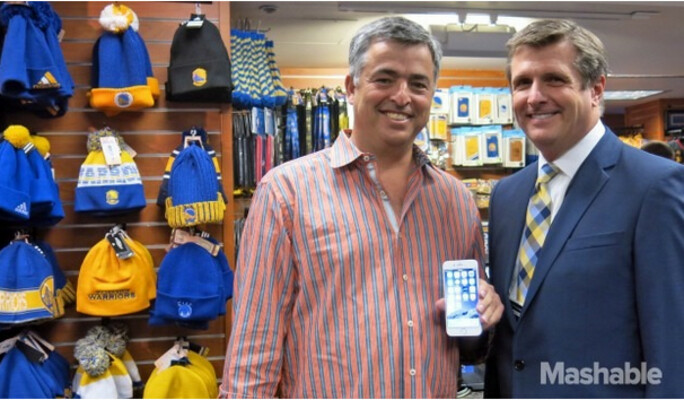 Apple executive Eddy Cue, said to be a fan of the NBA's Golden State Warriors, was at Oracle Arena last night. Not only was Cue there to catch the Western Division leaders, he also was at the arena to help introduce Apple Pay to fans making purchases at the team store. Oracle is now the second Arena in the NBA to accept Apple's mobile payment service. At sports arenas and stadiums, fans wait on line for food and souvenirs. The shorter the lines, the quicker they can get back to the seats that they spent a fortune on to watch the action. And that is where a mobile payment service like Apple comes into play. Instead of taking the time to take a card out of your wallet, swiping it and signing the receipt, Apple Pay is much faster. With the service, you stand by the NFC terminal pressing down on Touch ID, and you're all done. And for Apple Watch users, all they need is to have the timepiece unlocked with their iPhone nearby. Double tap on the side button of the Apple Watch and the transaction is completed. If you have an Apple iPhone 5, which doesn't support Touch ID or NFC, you can still use Apple Pay to make a payment. Since the Apple Watch has NFC, sign in using your passcode on the phone or the watch. Apple Pay has really raised the public's awareness of mobile payment services. Google Wallet, for example, had lived in anonymity for many years. Now that Apple Pay has the public interested in paying with their mobile devices, Google has purchased the technology and patents from Softcard. Samsung has introduced Samsung Pay and has purchased LoopPay. By the way, Cue was wearing an Apple Watch at the game although he used his Apple iPhone 6 to make a purchase at the Warriors team store using Apple Pay. This is great. I hav Apple pay on my work phone and it works seamlessly. Used it this morning at subway. It's an absolute joy to use, especially to avoid that damn tip jar. Meh, Samsung Pay is better as it uses magnetic stripe. LoL. The way you said it is flawless. Hahaha. Always trying to troll, fool hasn't even tried Samsung pay, and who the hell cares about a magnetic strip!!! How can he, when Apple is in his mind.. All he does is: think of Apple. Samsung pay still hasn't even been shown off practically ,since samsung is a gimmicks champion lets wait and see if it actually works well or it's just marketing fluff , like most of touchwiz bloat. Anyway good thing for iphone user..
one of the main reason i bought the iphone 6 was due to apple pay and i was so bummed that apple pay doesnt even work in australia. i hope samsung pay will work in australia since the tap and pay did.